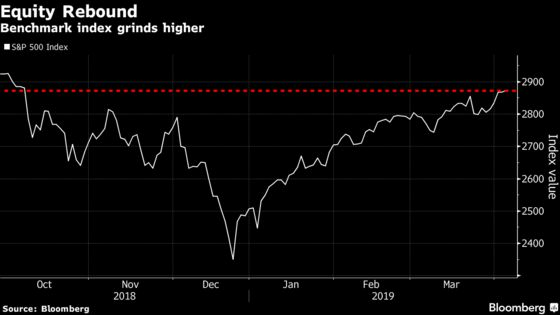 U.S. stocks staged a late rally to close at almost six-month highs as optimism over global growth revived investor risk appetite. Sovereign-debt yields continued to climb from recent two-year lows. The benchmark S&P 500 finished positive for a fifth day, equaling the longest winning streak in two months. U.S. equities had slumped midday after Bloomberg News reported that millions of Facebook user records were found on cloud computing servers. On the trade front, the deal that the U.S. and China are crafting would give Beijing until 2025 to meet commitments on commodity purchases and allow American companies to wholly own enterprises in the Asian nation, according to three people familiar with the talks. Investors are looking for fresh catalysts to sustain an equities rally that so far has weathered underwhelming global-growth data. Topping their agenda are signs of a rebound in China’s economy, the trade war possibly ending and moves toward a softer Brexit. Trade talks are continuing in Washington where Chinese Vice Premier Liu He began planned meetings on Wednesday. The Stoxx Europe 600 index jumped after a string of economic reports from Italy to Germany helped earlier to ease concern over the euro area’s growth outlook. Treasuries fell with sovereign bonds in Europe, where the key German 10-year yield climbed back above zero for the first time in a week. Elsewhere, oil hovered not far from a four-month high in New York. MSCI’s gauge of emerging-market stocks climbed to an eight-month high. The Bloomberg Commodities Index climbed for a third day as iron ore bounded higher on concern over supplies from Brazil. The monthly U.S. jobs report on Friday is projected to show non-farm payrolls up 180,000 in March, similar to the 186,000 average over the prior three months, after recent readings whipsawed analysts. India’s central bank will set policy on Thursday. The S&P 500 Index rose 0.2 percent as of 4:05 p.m. New York time, while the Nasdaq Composite Index gained 0.6 percent and the Dow Jones Industrial Average gained 0.2 percent. The Stoxx Europe 600 climbed 1 percent, the fourth consecutive rise. The MSCI Emerging Market Index climbed 0.8 percent, the fifth straight increase. The MSCI Asia Pacific Index rose 0.8 percent, the fourth consecutive gain. The euro gained 0.3 percent to $1.1240, while the yen weakened 0.1 percent to 111.46 per dollar. The British pound strengthened 0.3 percent to $1.3163, the third straight increase. The MSCI Emerging Markets Currency Index increased 0.2 percent. The yield on 10-year Treasuries rose four basis points to 2.52 percent. Germany’s 10-year yield increased six basis points to 0.01 percent. Britain’s 10-year yield jumped nine basis points to 1.10 percent. West Texas Intermediate fell 0.3 percent to $62.42 a barrel, the first drop in four days. Gold eased 0.2 percent to $1,290 an ounce. The Bloomberg Commodity Index rose 0.4 percent, the third straight increase.